Minor piece endgames are some of the most complex and important endings in chess. It comes down to the fundamental understanding of the “knight” and “bishop”, its strengths and limitations. Nothing shows a high class of a chess player as his ability to play the minor piece endings. Even Grandmasters have trouble playing some of these endgames correctly. When it comes to the club level, the situation becomes even worse. I’m sure you don’t want to lose a drawn position or miss out on a well-deserved win simply because you don’t know how to play out an endgame… You don’t want to blow your chances of getting the trophy, title or scoring an important victory just because you took a shortcut. 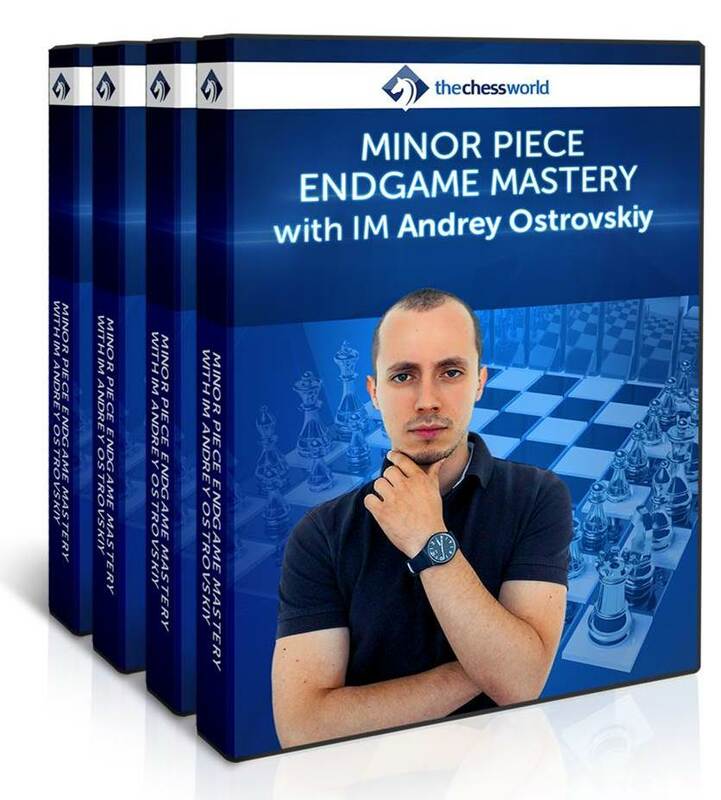 Unlike many other endgame books and courses, IM Ostrovskiy really takes time to explain each of the ideas in plain English, instead of giving zillions of different lines and variations. Andrey examines typical mistakes that both sides can make and gives you a clear and intuitive blueprint to follow. Ultimately, IM Ostrovskiy gives you the SYSTEM that will help you at playing the minor piece endgames and once you’ll get the hang of you’ll be playing on “an autopilot”! Your endgame understanding will improve and you will convert and save many endgames you never thought possible. That will lead to a big confidence boost and rating increase. You won’t be afraid to go into an endgame, knowing that it’s your territory and you have the highest odds of success. If you understand the minor piece endgames, it’s not just your endgame that will improve. By learning how minor pieces work together on a higher level, you will also improve your middlegame and tactics as well. How to convert the extra pawn? In this 15-lessons course we are going to take your Minor Piece Endings to the next level. You will learn the execution plans, ideas and strategies that Grandmasters use to convert these positions into victories. Get a $15 Gift Certificate to redeem in TheChessWorld Store for a video chess course*. First 100 buyers only.